New series! Arduino Lessons by Simon Monk & Ladyada in the Adafruit Learning system « Adafruit Industries – Makers, hackers, artists, designers and engineers! We’re pleased to announce we are updating all our Arduino tutorials with a new series! 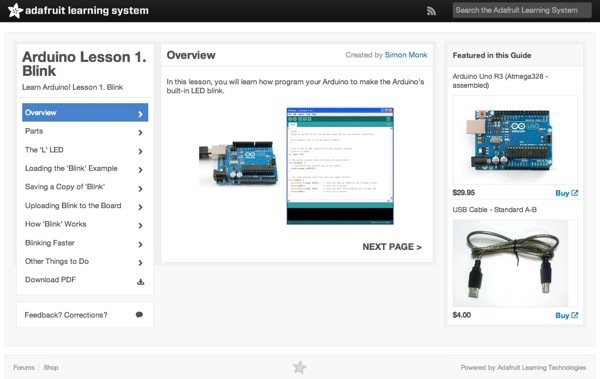 Arduino Lessons by Simon Monk & Ladyada in the Adafruit Learning system (learn.adafruit.com)! Simon is one of the best educational writers in the world and we also stock his fantastic book(s) here in the Adafruit store! Check back each day for a NEW lesson! Today’s first lesson is, Arduino Lesson 1. Blink. In this lesson, you will learn how program your Arduino to make the Arduino’s built-in LED blink. First lesson looks great. Since I’m really new with the Arduino, These will be very helpful to me.